As the trends of authentic flavors and convenience continue to simmer, Mexico’s No. 1 selling salsa brand has introduced a line of Mexican Cooking Sauces that make it easier for people to enjoy their favorite authentic Mexican dishes in a fraction of the time: a difference of minutes versus hours. As the demand for more authentic and sophisticated Mexican cuisine increases and consumers have less time to cook, this unique new product provides a solution. HERDEZ® Mexican Cooking Sauces are the next ‘evolution’ of authentic Mexican cooking at home. More info at: www.herdezcookingsauces.com. The HERDEZ® Mexican Cooking Sauces are versatile and easy to use. A recent survey conducted by the makers of HERDEZ® Brand, indicated home cooks are looking for short cuts when making homemade meals. With these new Mexican Cooking Sauces, consumers can simply add the sauces to any protein and simmer for 7-10 mi nutes for a quick meal, or they can use the sauces as an ingredient in a more complex dish as their time allows. Respondents of the survey also expressed that a product like this would encourage them to cook Mexican dishes at home more frequently and to try new flavors they may not have tried before. Sauce varieties include Traditional Chipotle, Roasted Pasilla Chile, Red Guajillo Chile and Tomatillo Verde. “The four flavors we’ve chosen for the launch of the HERDEZ® Mexican Cooking Sauces are foundational within authentic Mexican cooking. The sauces do not compromise on the delivery of real, authentic flavor, yet allow consumers to forego the time, effort and know-how associated with making these sauces from scratch,” said Gilberto Gutierrez, brand manager, HERDEZ® Brand & Import Foods for MegaMex Foods, LLC. The authentic flavors in the HERDEZ® Mexican Cooking Sauces come from the rich, fragrant flavors of chile peppers used as the base. Chile peppers are at the core of Mexico’s contributions to the culinary world and are used for adding flavor more than heat. Consumers, who are not seekers of spicy foods, need not fear this new line of Mexican Cooking Sauces because they are focused on flavor. HERDEZ® Mexican Cooking Sauces are currently available at Los Angeles area Albertsons stores with increased distribution scheduled for June in Wal-Mart stores nationwide. The suggested retail price is $3.49for a 12-ounce jar (4 servings). For more information and recipes visit www.herdezcookingsauces.com. Traditional Chipotle – Chipotle simply means “smoked chili pepper.” Brown and shriveled chipotles provide a warm, smoky flavor. Combined with the sweet tang of tomato, onion and vinegar, the HERDEZ® Traditional Chipotle Sauce delivers a deliciously authentic taste. Roasted Pasilla Chile – Named for its dark, wrinkled skin, the Pasilla Chile is rich in flavor, yet mild in heat. A wonderful blend of tomatoes, onions, and garlic accompany the chile to create the hearty HERDEZ® Roasted Pasilla Chile Sauce. Red Guajillo Chile – The Guajillo Chile’s thin, deep-red flesh delivers a delicious green tea flavor with slight berry overtones. Combined with vine-ripened tomatoes, the HERDEZ® Red Guajillo Chile Sauce has a tangy, fruity finish with mild heat. Tomatillo Verde – The Tomatillo is a staple in Mexican cuisine. Its green color and tart flavor are its most distinguishing features. A vibrant and zesty blend of tomatillos and chilies combined with a hint of cilantro give the HERDEZ® Tomatillo Verde Sauce its complex flavor and medium heat. Hormel’s MegaMex JV launches Mexican sauces MegaMex Foods introduced a line of sauces under the Herdez brand. Hormel Foods Achieves $2 Billion in New Product Sales Hormel Foods met its ambitious “Go for $2B by 2012” goal by achieving $2 billion in total sales from new products created since 2000. HERDEZ® Salsa is made the authentic way, using fresh ingredients like tomatoes, onions, chile peppers and cilantro. Today, HERDEZ® Salsa is the #1 salsa brand in Mexico and a growing staple in homes in the United States. 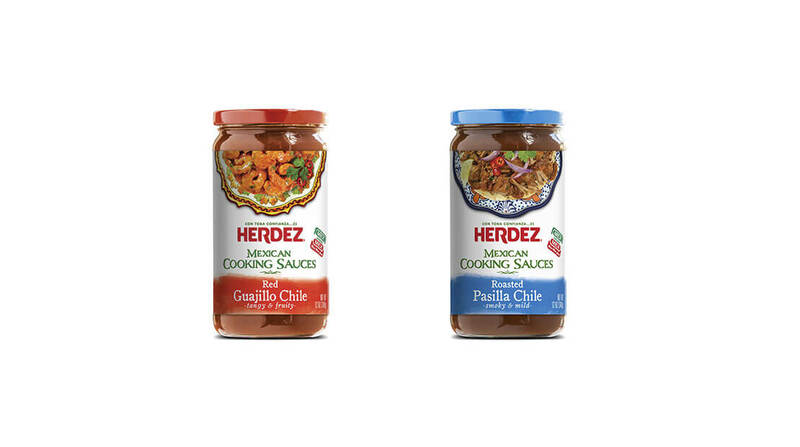 With the launch of their new line of authentic Mexican Cooking Sauces, HERDEZ® Brand continues to bring the flavors of Mexico to the homes of millions. HERDEZ® Brand authentic Mexican products are available nationwide at major grocery stores.